By George Czerny, Sandpiper 565, "Wind Song"
If there’s one thing I learned from visiting the Tullett Prebon London International Boat Show in January of 2010, it is that you don’t have to own a boat in order to enjoy boating in the United Kingdom. A vast array of boating experiences awaits anyone who would venture to sign on the dotted line and pay the price; sometimes a very reasonable price. Time and time again, as I wandered through the cavernous ExCel London exhibition centre, I came across companies offering memberships in boating companies, or offering to provide you with a memorable boating experience; either motorized, or under sail. Memorable it was to meet John Clarke as he stood in his booth area for Team Sailing of Gosport, Hampshire. Chances are that if you called Team Sailing, the person answering the telephone would be John Clarke. He does a little bit of everything, even though his title is that of managing director of the company which has been in business for almost a dozen years. Living in the area of Canada that boasts “if you can ski downhill at Blue Mountain, you can ski anywhere”, I listened with interest to John as he told me about sailing on the Solent, offshore from Portsmouth, where Admiral Nelson’s ship “The Victory” rests as a tourist attraction. “You’re never more than a half-hour from a safe harbour,” said John, adding “if you can sail the Solent, you can sail anywhere”. His company uses a Sigma 38 and new Bavaria 38s for a sailing menu that features everything from weekend sailing to cruises and race training. Weekend sailing, tied to a holiday in Britain, could be a lot of fun. At Team Sailing, the cost for such a nautical adventure starts at 160 pounds (approximately $250 Cdn.). For more information, e-mail to: info@teamsailing.co.uk. 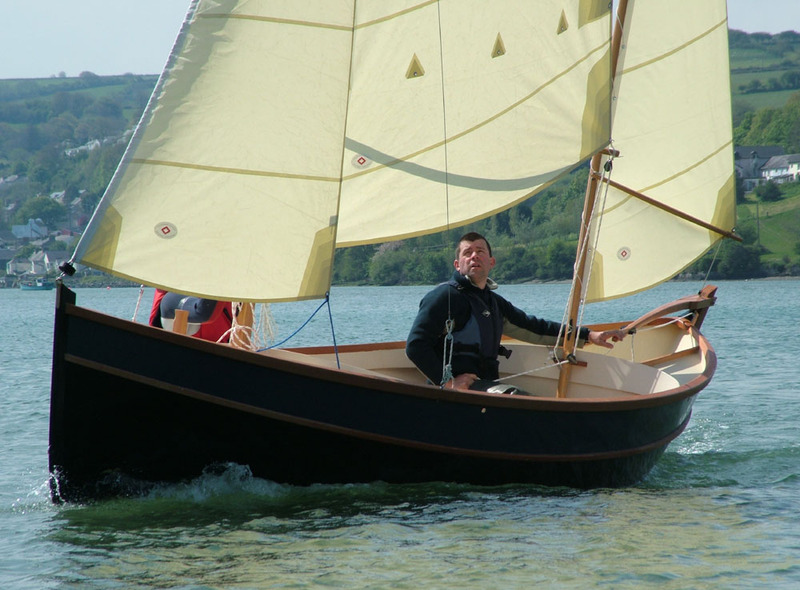 Another sailor who enjoys the Solent is Jim Crick of Hamble Point Yacht Charters. Jim, who is a RYA Yachtmaster instructor says his company offers a variety of services. “We’ll do as you request,” he told me, pointing out that he was familiar with Tobermory, Ontario and was looking for a picture of the City of Midland which once plied the waters of Georgian Bay. Length over deck 17' 0"
Draught 1' 7" - 4' 0"
Length over deck 19' 3"
Draught 1' 6" - 4' 0"
Length over deck 22' 0"
Draught 2' 4" - 5' 0"
There were some rebirths of boat-building companies evident at the London show. About a year and a half ago, 30 people employed at a small boat-building firm in Rock, Cornwall lost their jobs as another British manufacturing company closed. Now, after one of the most difficult trading periods in living memory, specialist, classic boat-builders, Cornish Crabbers has re-opened and re-employed 24 staff. The company sold more boats in 2009, than in any previous period in its 36-year history, notes a company press release. The release noted that the new company’s chairman, Philip Langsdale, a Cornish Crabber owner, bought the company which launched its newest model, the Crabber 26, at the show. 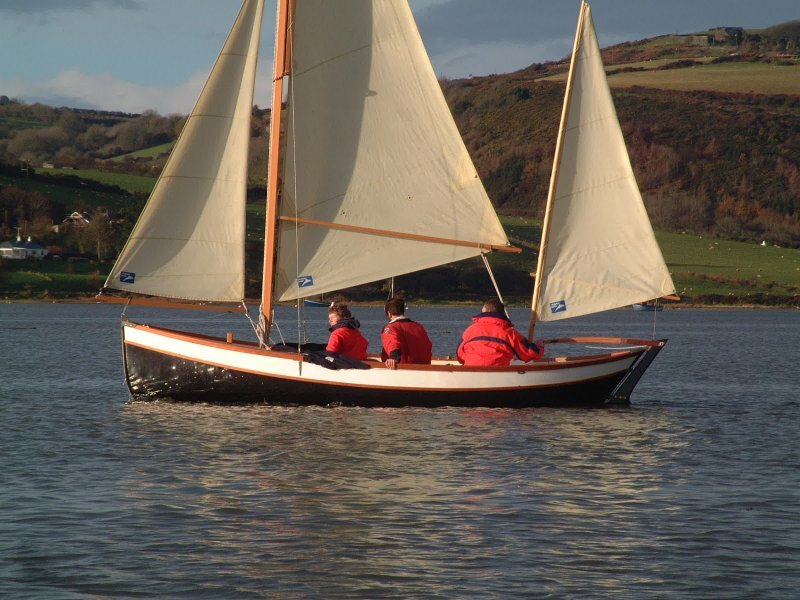 Check out www.cornishcrabbers.co.uk to review what are described as “simply the best gaffers in the world”. Even though I had my wife Nancy touring the show with me, my heart pounded here and there as we moved from boat display to boat display. 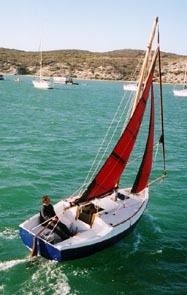 In the North American sailboat market, I know that one line of MacGregor sailboats is a popular, water-ballasted craft. In the United Kingdom, Swallow Boats had me drooling over their Bay Cruiser 20 and the new Bay Cruiser 23; both highly-attractive, trailerable sailboats. For more information, click on www.swallowboats.com. Then, suddenly, my heart skipped a beat, as the Honnor Marine Ltd., display hove into view. My eyes passed over the Original Devon Lugger and feasted on the Cape Cutter 19. Sweet, I thought, as my first-blush review indicated a slight resemblance to my 33-year-old Sandpiper 565. Yes, there is a forward berth area and there are berths that stretch back on each side, towards the stern, underneath the cockpit. But the resemblance ended there as I realized that this beautiful craft was akin to my Sandpiper in “souped up” mode; a Sandpiper on steroids, if you will. The Cape Cutter 19 has features galore in a small-boat package that is certain to delight. I had Nancy taking photographs of me aboard the Cape Cutter 19 when Colonel Mike Brooke, OBE, captured us both with his charm and nautical explanations. Brooke, is a sales executive for Honnor Marine which is owned by Norma and Bob Brown. They liked the boat so much a few years back that they purchased the manufacturing company and moved it from South Africa to England. I talked to the Browns, while Mike Brooke ushered Nancy to a nearby computer monitor and gave her proof that very few sailors know the Cape Cutter 19 as well as he does. In September 2008, the colonel sailed “Theo’s Future” – a Cape Cutter 19 – into Bosham Harbour, West Sussex, completing a charity circumnavigation of Britain’s coastline to raise funds for the eye research charity, Fight for Sight. Mike completed the 1,500-nautical mile voyage to raise more than 27,500 pounds ( approximately $43,000 Cdn.) for work to treat people with Leber’s congenital amaurosis (LCA). On his fund-raising voyage, Mike was joined by volunteer crew members, some experienced, some novices. His inspiration for his “Round Britain Sailing Challenge” is his godson, Theo Holroyd, who was born with LCA. Colonel Mike Brooke is a veteran sailor. I am a novice. But we have more in common than a love of the wind and water. Mike and his wife Pippa operate the Benbow B & B in Bosham, Chichester, West Sussex. “Why don’t you come and stay at our B & B and we’ll go sailing?” suggested the affable Brit, adding “and we’ll come and stay at your B & B and go sailing.” That’s OK with me, but I might have to class Michael up, so to speak, to a more challenging craft at the Collingwood Yacht Club! Perhaps, I could get him to be a guest speaker locally. For more about Honnor Marine, check www.honnormarine.co.uk. One of my original reasons for going to the London International Boat show was to find out more about canal boat trips. I was not disappointed. The Inland Waterway Association’s (IWA) volunteers did stellar duty from their booth. The IWA is a registered charity which campaigns for the conservation, restoration and development of inland waterways in the U.K. While I have never traveled by waterbus on Regent’s Canal, the next time I am in London I shall. The London Waterbus Company caught me eye, promoting their waterbus. Regent’s Canal, which links Little Venice to the Thames at Limehouse, was first opened in 1820. Today, the trip features unique architecture, industrial history, wildlife and scenery. Plus, you get a crew aboard the waterbus to answer questions. To take the trip, just turn up and pay on board. You can also take a side trip to the London Zoo by waterbus. For more information, click on www.londonwaterbus.com. If you want to hire a long boat, consider Reading Marine Co., which operates on the Kennet and Avon Canal and on the Thames River. For more information, click on www.readingmarine.co.uk. If you want to see the narrow, long boats first-hand, consider attending one of the many festivals in the U.K. The Inland Waterways Association will hold its National Festival and Boat Show from August 28 to 30, 2010 at Beale Park, Lower Basildon. For more information, click on www.waterways.org.uk where you can get information about other such gatherings. When you think of the London International Boat Show, think of a catamaran to get an idea of the layout. The Excel London centre is immense in size and has a north hall and a parallel south hall. I likened them to the hulls on a catamaran and the space between those “hulls” was a bright and airy space punctuated with cafeteria-type seating for those who patronize any of a number of take-away restaurants. There were also displays in the centre part of the ExCel London centre, one of which was a Royal Navy booth complete with a high-performance inflatable craft and an entertaining group of RN musicians. I had to pry Nancy away from booths were clothing and accessories were evident; at the same time picking up a nautical books catalogue from A & C Black Publishers. For more information about the treasure trove of nautical books they offer, check www.adlardcoles.com. One display that had both of us oohing and aahing had nothing to do with boats. It was presented by the Breeze House Company which features an upscale range of gazebo-type structures. Click on www.breezehouse.co.uk. Becky Clare Hester, public relations co-ordinator with the British Marine Federation/National Boat Shows made us welcome at the boat show and reminded us that plans are under way for their next big event. It’s the in-water Southampton International Boat Show, scheduled for September 10 to 19, 2010. Looking ahead, if you’re thinking of attending the London Boat Show in 2011, keep in mind that it is easy to get to the ExCel London centre. Various events are held there during the year. Take the underground (or “tube”, as they call it) east from Downtown London and get yourself onto the Docklands Light Railway to Custom House for ExCel station. Part of that train trip will be above ground giving you an interesting glimpse of East London where redevelopment is taking place at a brisk rate. The London boat show wasn’t the only place in England where I found something of nautical interest. While watching BBC-TV, I saw a report about sailor Geoff Holt. In early January he became the first quadriplegic to cross the Atlantic. It took him 28 days to travel from Lanzarote to Cane Garden Bay in Tortola. It was Holt’s fourth time sailing across the Atlantic, but the first time since a life-changing accident in 1984 which left him paralysed from the chest down. Since the accident, he also became the first disabled person to sail single-handed around Great Britain in an expedition he called “Personal Everest”. Sailing. Boat shows. One never knows what beauty, boats, or inspiration, one will find! 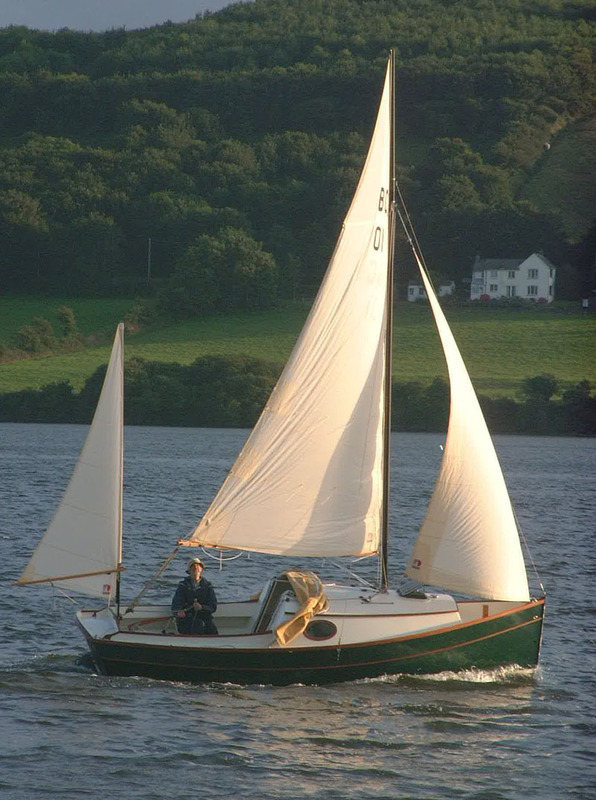 Editor’s note: George Czerny is a retired newspaper publisher who operates Georgian Blue B & B in Craigleith, Ontario and skippers “Wind Song” his Sandpiper 565 when time and temperature allow. Website created on May 1/2007, Last updated on March 10, 2010.